Considering we’re just about halfway through the series, I think the plot is finally starting to advance at a fairly good pace. We not only got a decent and in-depth background on the relationships between Chihaya, Arata and Taichi, but also what led to Chihaya enjoying karuta so much. Not to mention we now have Chihaya with an official karuta club and new friends, all of whom are training to compete in the Tokyo competition in order to go to nationals. Speaking of which, it looks like we have a bit of a time jump and we see several groups of teenagers – all part of different karuta clubs for different schools – whispering about Chihaya. 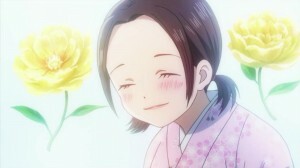 Of course, she’s oblivious to all of the talk and is busy doing her stretches; all while wearing a hakama. This causes quite the buzz around the tournament since it’s uncommon for people to wear hakama during tournaments, except for the competitions to see who becomes the new Meiji and Queen. Taichi approaches her and asks if she’s doing alright, but she seems exceptionally excited about the whole thing. 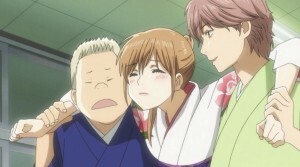 She excitedly tells Taichi that everyone in the whole building is a fan of karuta. She even goes so far as to say they’re all bonkers for karuta, but Taichi tells her not to go that far because she might offend someone. The two head down the hallway to a classroom where Kanade is getting Nishida and Komano dressed in their hakama, much to Nishida’s protests. He whines, saying that they’re uncomfortable and hard to move in, but Kanade scolds him and reminds him that they need to get used to wearing them for when they get to the national tournament. Several others overhear her comment and although they look angry, they don’t say much. When Taichi and Chihaya enter the room, someone calls out to them and it turns out to be the same middle schooler that Arata defeated when they first went to the activity center in town. 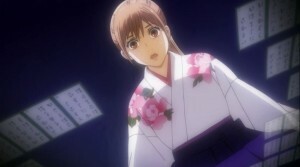 Chihaya can’t think of his name for a moment, but does eventually remember him, much to his chagrin. They then start comparing their teams and Chihaya is surprised to find that his club not only has two Class A players, but they’ve also made it to nationals five years in a row. However, I think this only makes her more determined to get to the nationals instead of him. The groups eventually find their way into the main room where they’re divided into two main groups; each group will face each other in a bracketed tournament before the finalists of each group face off. 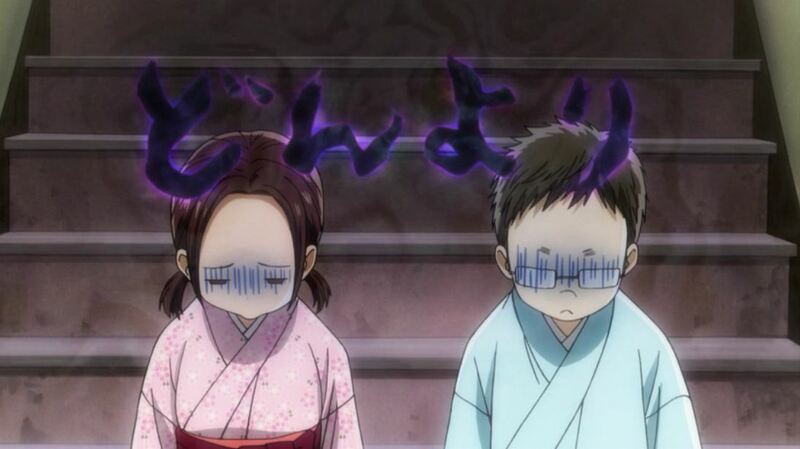 Taichi is relieved to find that they weren’t placed in the same group as the boy Chihaya was speaking to earlier. The teams start facing off against one another and several girls start whispering about Chihaya’s team and how they overheard Kanade saying that they’re going to the national tournament. They start to laugh about the audacity of her statement, but are soon silenced when they see Chihaya’s skill. Neither Kanade nor Komano win their match that round, but because Chihaya, Taichi and Nishida were able to win their match, they advance to the next round. 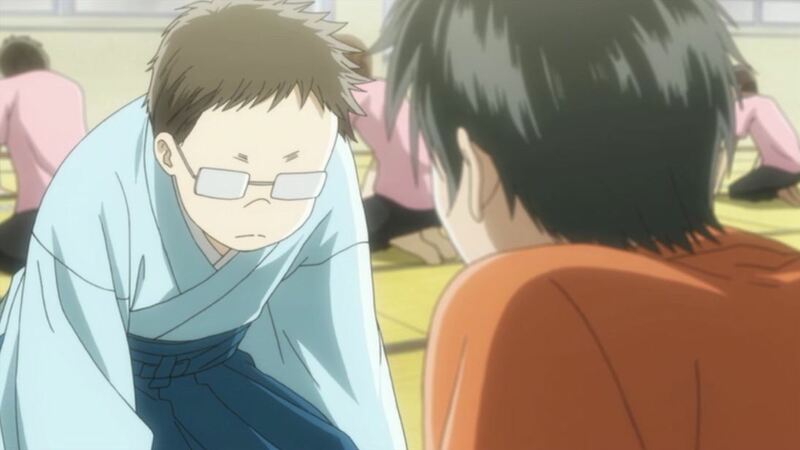 Chihaya disappears to text Arata and tell him that they’re in a tournament and doing well when Taichi approaches her and asks why she and Arata are suddenly talking so much. Chihaya says that they aren’t actually talking; she texts him, but he never responds! Taichi grows somewhat gloomy when he realizes that both he and Arata view Chihaya as theirs (a bit possessive, but I’ll give him a pass for now). Meanwhile, Nishida is still chatting with Kanade and Komano, who ask who Chihaya is texting so often. Nishida tells them about Arata and how Chihaya hopes to make it to the national tournament in order to see him again. Kanade is excited about this and the lure of a long-distance love, but Komano seems to be a bit downed and maybe even angry about the whole thing. Unfortunately, he doesn’t have time to dwell on those thoughts since their next match is about to start. Everything progresses as usual; Chihaya, Taichi and Nishida dominate their matches while Kanade and Komano struggle just to keep up. The surprising thing is that Kanade actually manages to win her match, though Komano is so overwhelmed that he gets frustrated and isn’t able to focus enough to win. After that match, they stop for a lunch break, though Komano informs them that he’ll be skipping the semi-finals. Everyone is upset about this, but he shouts at them, saying that they don’t really need him since they just need three wins anyway. Before he is able to storm off, Taichi orders him to participate to the finals whether he wants to or not. After that, Komano storms off and the remnants of their team get ready for their next match. Taichi stops Chihaya and tells him that she absolutely can’t lose her match or they’ll never make it to the finals and she’ll lose her chance to see Arata. This seems to put quite a bit of pressure on Chihaya and coupled with the guilt she feels about being unable to bring everyone together as a team, it affects her games quite badly. Of course, the team they’re facing – though they aren’t very good – have a strong sense of being a team and cheer each other on. Their cheering ends up rattling Chihaya’s team’s focus and even their determination. Chihaya seems to have the worst of it though; not only can she not focus, but it’s almost as if she can’t hear anything. She even misses the impassionate gods card, which is a blow to everyone. The people watching from the sidelines wonder why her game is suddenly so off and one guy thinks that she’s doing it on purpose to surprise everyone. Taichi notices that Chihaya isn’t doing so well and manages to cheer everyone on, improving their game. It’s seeing Komano peeking through the doorway and silently cheering her on that really manages to break through her funk. She’s able to even the score quickly, even though she was initially down six cards (which is apparently a huge gap in karuta). Of course, her sudden speed and skill throws off her opponent and makes it a little easier for her to win. In fact, everyone wins and the group advances to the finals. Celebration is short lived because Chihaya promptly passes out and has to be carried by Taichi and Nishida. Outside of the room, Komano is grabbed by Kanade and he apologizes for his attitude earlier, but she simply scolds him for loosening his obi. As she adjusts it for him, she tells him that he shouldn’t feel so downheartened about not being able to win right away. She mentions that their opponents have callouses on their feet from dedicating years to the tatami, and that seems to improve Komano’s mood somewhat. Chihaya shouts something in her sleep and they all laugh. It looks like Chihaya has finally gotten the team she’s always wanted. Opinions: A decent amount happened in this episode, though I wouldn’t say it was the most action-packed episode. There were a lot of quality moments though. Seeing Komano finally voice his concerns about just being used to get Chihaya to the national tournament so she can meet up with Arata again was both heartbreaking and justified. I can understand why he feels that way, but I don’t think the others were expecting him to blow up that way at them. 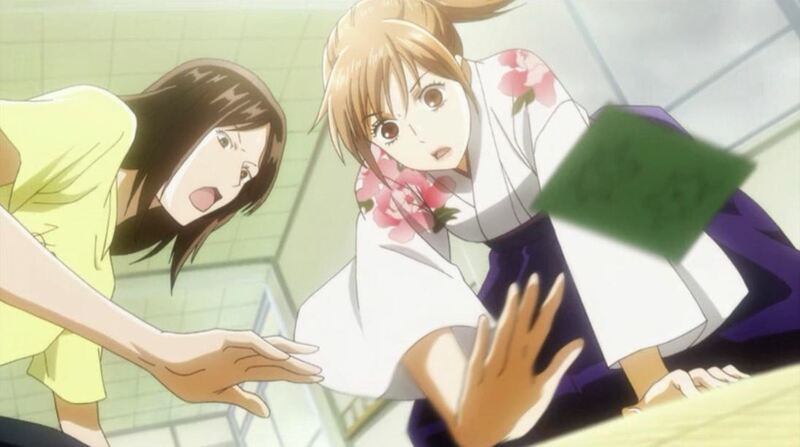 Seeing Chihaya completely broken after realizing that they were never really a team proves that she really takes karuta seriously, but takes her friend’s feelings even more seriously than the game itself. I’m glad that Komano really started to cheer her on, because that made the biggest difference in whether Chihaya would have been able to win or not. It’ll be interesting to see how everything will continue in the finals, that’s for sure.